Lancaster County wineries sure know how to throw a party. Whether it’s jazz in the evening, picnics on the lawn or tasting new wines while enjoying the view, you are guaranteed to have a good time. Recent rains have turned the county green once again and views from many of the wineries are relaxing and reminiscent of Napa or Sonoma. – and you don’t need to buy a plane ticket! Harvest season is just a few short weeks away, and fall colors always go better with a glass of wine. Here’s a listing of events that are just a short drive from The Artist’s Inn. Then again, a day of tasting followed by a night on the porch provides some spectacular views as well. Moon Dancer Winery - Live music Friday nights, Saturday and Sunday afternoons. Mt. Hope Winery - Mt. Hope winery has the biggest party of them all – the PA Renaissance Faire...every weekend until October 30. Twin Brook Winery - Enjoy their gazebo concerts on Friday evenings. Waltz Vineyards – Here are some pictures from one of their lawn events. 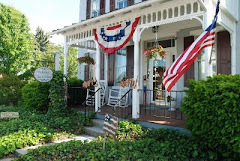 Don’t let summer slip away before you enjoy the red, white and green of Lancaster County.